The origin of the phrase Science Fiction has some cool meaning behind it. 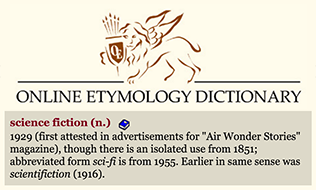 Etymonline says the phrase was first used in 1929, which was a play off the existing term scientifiction from 1916. 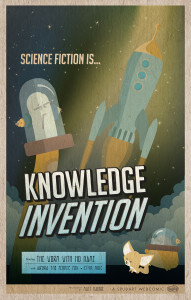 Digging deeper into the etymology of both science and fiction reveals deeper meanings. Science comes from knowledge acquired by study. To have that paired up with fiction really makes an incredible oxymoron. This oxymoron by itself felt like it was enough for a webcomic, but there wasn’t much of a pun. I’m trying to make the Spudart webcomic to not fit in the type of a webcomic where there has to be a pun or joke. But it’s hard to resist the expectation that people have for a webcomic to have that pun at the end. In searching for the pun, I continued to look up the word origin second half of science fiction. Maybe there would be something funny! The word fiction didn’t really reveal all to much. Dissimulation, ruse; invention, fabrication. The invention part seemed cool, and that coolness ties back in with my original thoughts of what science fiction means–something simply cool. I rather like that rhythm in the comic of starting with something simple like an observation. Then going into the detailed research, and then coming back circle to the the simple observation. This pattern ties up the experience many people have when learning. There’s the initial curiosity. The exploration. Then the resulting circle comes back to the initial curiosity. Learning is so much fun. I love sharing this process through this Spudart comic. To help illustrate the conversation in this comic, I designed three sci-fi posters. Therefore, today’s webcomic comes with the extra bonus of three movie posters. I wanted these to be really quick posters, because I knew they would be tiny in the comic. If there ends up being a larger demand for the posters, I’ll go and add more detailing and shading. 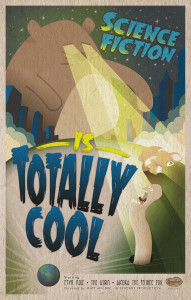 They are a fun exploration of taking classic sci-fi posters and putting in the Spudart comic characters. Each poster has a blog post explaining the original inspiration and details such as fonts and background story. Paper: The word "science" comes from the Latin word "scientia" meaning knowledge. Worm: thus Sci-fi is Knowledge fiction. What an oxymoron! 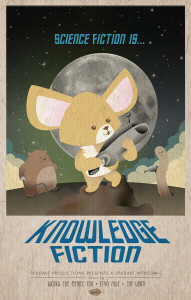 Knowledge AND fiction?! Worm: ...because science and fiction aren’t contradictory. Worm: They say the double noun construction in Science Fiction may allow for the first noun to qualify the second noun—effectively making the phrase Scientific Fiction. Worm: Implying that science is not really science, but a quasi-science. Worm: However, the origin of Science does mean knowledge acquired by study, not quasi-knowledge (depending on your political leanings). Etym: and when you look at the etymology of "fiction"
I probably could have cut down on the amount of words used in this one.